Wagon Tales, under jockey Rodrigo Vallejo, breaks his maiden in the $100,000 Remington Park Juvenile on Sunday afternoon. 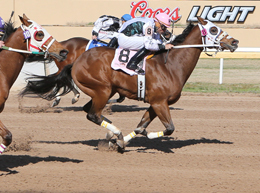 OKLAHOMA CITY, OK�APRIL 21, 2013�Horses that competed in trials for the Remington Park Futurity but did not make the lucrative final on Saturday night, had their opportunity for a big-money stakes in Sunday�s $100,000 Remington Park Juvenile. Wagon Tales took command halfway through the 330-yard race, drawing away to win by a half-length. Owned by JNB Enterprises, LLC of Mission, Texas and trained by Judd Kearl, Wagon Tales was ridden to the win by Rodrigo Vallejo. A 2-year-old colt, Wagon Tales crossed the finish in :16.834 seconds over the fast track. Champion Huddle won the photo for place by a head over Stolin Credits. Wagon Tales was 9-1 in the wagering and paid $21.40 to win, $11 to place and $5.40 to show. Champion Huddle returned $13 to place and $5.60 to show. Stolin Credits paid $7.20 to show. Nudi Suit was the beaten wagering favorite at 2-1 odds, finishing fourth. Wagon Tales is an Oklahoma-bred by PYC PAINT YOUR WAGON from the Shazoom mare Signs Zoomer and was bred in state by The Mixer Ranch. The first win of his career from just two starts, the Remington Park Juvenile was worth $40,000 and makes the overall money for Wagon Tales $43,446. Marty Ireland saddled Champion Huddle to a second place effort for owner Terry Freeman. Bred and ridden by Debbie Freeman, the gelding earned $17,000. Still winless after two starts, Stolin Credits picked up $11,000 for owner Dan and Louise Jones. Luis Villafranco trains the filly ridden by Cody Jensen. Vaughn and Jill Cook bred Stolin Credits from the Special Leader mare Danika. Completing the field were Nudi Suit, Y A Tittle, Little Pyc, Jess Send Me Candy, Painted Laico Bird, Marcar and Bp Southern Success.